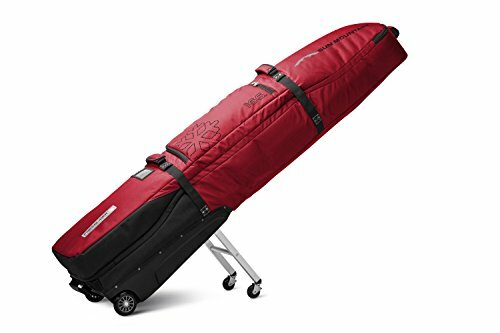 Sun Mountain FreeGlider Travel Bag Sun Mountain's ClubGlider® has revolutionized the way golfers travel with their clubs, so why not apply that technology to other sports? New for 2016, we adapted ClubGlider's integrated leg system for use in ski and snow board travel. The leg system supports 100% of the weight of the bag and makes traveling effortless. Features * Fits 166 cm snowboards * Holds two boards and two pair of boots with room to spare * Heavy-duty, two-way zippers run the full length of the bag for easy loading * Bag is fully padded to protect your gear * Leg mechanism is extended and retracted in one easy motion * Legs retract into molded tray for travel * High-impact roller blade wheels with durable heat-treated axles for strength * Reinforced in wear areas * An internal cinch strap secures the board in place * Folds for storage. Folded dimensions 26" x 12" x 14"
If you have any questions about this product by Sun Mountain, contact us by completing and submitting the form below. If you are looking for a specif part number, please include it with your message.